Hitting a golf ball on the sweet spot increases optimum distance and accuracy. Golf balls feature what many golfers consider a near-elusive spot—the "sweet" spot. This is the place on the ball that golfers aim to strike because it helps ensure maximum distance on shots from the tee box, fairway and even the rough. Striking the sweet spot can produce that crisp, well-played shot that leads to a birdie—and a memorable round. Find a Club's "Hot Spot"
Before attempting your tee shot, find the "hot spot" on your driver—the place on the clubhead that will result in maximum distance on your drive when striking the ball. The hot spot is fairly easy to find; it is just above the center of the clubface. To be more precise, golf teacher Peter Kostis recommends drawing a small circle on a golf ball with an erasable marker. Tee up the ball with the circle pointing straight back at the clubface at point of address. After hitting a drive, check the clubhead to see if the mark is just above the center of the clubface. To hit a golf ball on the sweet spot, it's vital to maintain a proper stance to ensure a proper swing, and thus, contact with the sweet spot. Grip the club, making sure to keep the clubface square (the bottom of the face should be perpendicular to your target line). Make sure your feet, thighs, hips and shoulders are parallel with one another and with the intended target line. Take an easy, controlled swing. Teeing up the ball properly for a tee shot is crucial to ensuring contact with the sweet spot; placing the ball too high or low may result in an errant shot. To properly place the ball on the tee, half of the ball should sit above the top of a driver that is resting on the ground. 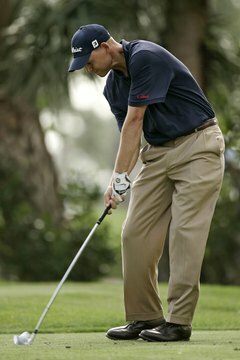 It's better to tee the ball too high than too low because most golfers have a "sweeping" swing, which is bound to result in better contact on a higher-placed tee.